Objective To investigate the association between treatment induced change in high density lipoprotein cholesterol and total death, coronary heart disease death, and coronary heart disease events (coronary heart disease death and non-fatal myocardial infarction) adjusted for changes in low density lipoprotein cholesterol and drug class in randomised trials of lipid modifying interventions. Design Systematic review and meta-regression analysis of randomised controlled trials. Data sources Medline, Embase, Central, CINAHL, and AMED to October 2006 supplemented by contact with experts in the field. Study selection In teams of two, reviewers independently determined eligibility of randomised trials that tested lipid modifying interventions to reduce cardiovascular risk, reported high density lipoprotein cholesterol and mortality or myocardial infarctions separately for treatment groups, and treated and followed participants for at least six months. Data extraction and synthesis Using standardised, pre-piloted forms, reviewers independently extracted relevant information from each article. The change in lipid concentrations for each trial and the weighted risk ratios for clinical outcomes were calculated. Results The meta-regression analysis included 108 randomised trials involving 299 310 participants at risk of cardiovascular events. All analyses that adjusted for changes in low density lipoprotein cholesterol showed no association between treatment induced change in high density lipoprotein cholesterol and risk ratios for coronary heart disease deaths, coronary heart disease events, or total deaths. With all trials included, change in high density lipoprotein cholesterol explained almost no variability (<1%) in any of the outcomes. The change in the quotient of low density lipoprotein cholesterol and high density lipoprotein cholesterol did not explain more of the variability in any of the outcomes than did the change in low density lipoprotein cholesterol alone. For a 10 mg/dl (0.26 mmol/l) reduction in low density lipoprotein cholesterol, the relative risk reduction was 7.2% (95% confidence interval 3.1% to 11%; P=0.001) for coronary heart disease deaths, 7.1% (4.5% to 9.8%; P<0.001) for coronary heart disease events, and 4.4% (1.6% to 7.2%; P=0.002) for total deaths, when adjusted for change in high density lipoprotein cholesterol and drug class. Conclusions Available data suggest that simply increasing the amount of circulating high density lipoprotein cholesterol does not reduce the risk of coronary heart disease events, coronary heart disease deaths, or total deaths. The results support reduction in low density lipoprotein cholesterol as the primary goal for lipid modifying interventions. The association between high density lipoprotein cholesterol concentrations and coronary heart disease in observational studies does not, however, establish the extent to which changes in high density lipoprotein cholesterol will alter the risk of coronary heart disease events. Many large randomised trials and meta-analyses led to the identification of low density lipoprotein cholesterol as the principal target for lipid modifying interventions.8 9 Evidence that raising high density lipoprotein cholesterol will reduce cardiovascular adverse outcomes remains controversial. We used meta-regression techniques in an updated, more comprehensive systematic review of randomised trials to explore an independent link between changes in high density lipoprotein cholesterol, not limited to statins but covering all lipid modifying treatment, and coronary heart disease related morbidity and mortality. We built our search for relevant studies on the sensitive search strategies used in previous systematic reviews supplemented with relevant keywords and medical subject headings.21 24 25 26 27 28 To update this evidence, MB and NB (an experienced librarian) searched Medline, Embase, and Central (all from January 2003 to October 2006) in addition to CINAHL and AMED (both from their inception to October 2006). We used Cochrane sensitive search strategies for identifying randomised trials and made no restriction as to language. The detailed search strategy is available from the authors. We reviewed reference lists of eligible articles, recently published editorials, and reviews on the topic and consulted with experts. Two investigators independently extracted all relevant information on baseline characteristics of trials, patient populations, interventions, and outcomes from each eligible article by using standardised, pre-piloted data extraction forms. We recorded all available baseline and follow-up concentrations of total cholesterol, low density lipoprotein cholesterol, high density lipoprotein cholesterol, and triglycerides. In five trials that failed to report exact lipid concentrations, we abstracted data from graphs. Clinical end points were total deaths, coronary heart disease deaths, and coronary heart disease events (combined outcome of non-fatal myocardial infarction and coronary heart disease death). For coronary heart disease death, we extracted data by using the following hierarchy: coronary heart disease death, fatal myocardial infarction and sudden death, fatal myocardial infarction, fatal cardiac events, fatal cardiovascular events. We report means and standard deviations of lipid concentrations as milligrams per decilitre; we used the method of Hozo to convert data reported as median and range,31 and we followed the recommendations of the Cochrane methods group for data reported as median and 25th and 75th centiles.32 We calculated change in lipid concentrations for each trial as the difference between the mean change in the lipid concentration from baseline to the average follow-up concentrations in the intervention and control groups. We pooled treatment effects across studies by calculating inverse variance weighted average risk ratios and associated 95% confidence intervals for specified outcomes by using a random effects model. We used inverse variance weighted meta-regression analysis to investigate the association between differences in the change in high density lipoprotein cholesterol and low density lipoprotein cholesterol concentrations between treatment and control groups and the risk ratios of clinical outcomes of interest.33 34 To take into account non-lipid effects of specific drugs (such as potential pro-thrombotic effects of hormone therapy), we included a categorical variable of drug class in the meta-regression model and did a meta-regression analysis stratified by drug class. We used R2 to measure the proportion of the variability in the log risk ratio of an outcome explained by the statistical model. We analysed residuals to check model assumptions. To determine whether the potential relation between treatment induced changes in high density lipoprotein cholesterol and risk ratios for coronary heart disease events varied across drug classes, we tested for interactions between change in high density lipoprotein cholesterol and different classes of interventions by means of an F test. We found little evidence for interaction (P=0.73). That is, our analysis provided no support for the hypothesis that increase in high density lipoprotein cholesterol had a greater effect on patient important outcomes with some drugs than with others. Therefore, we omitted interaction terms to simplify the final model. Analyses with percentage change in lipid subfractions yielded similar results to analyses with absolute change (mg/dl) and are therefore not reported. In pre-specified sensitivity analyses, we focused on a more homogeneous sample of trials that used interventions known to raise high density lipoprotein cholesterol concentrations (rather than reducing triglycerides) and therefore excluded trials using n-3 fatty acids, low fat diets, or probucol, as well as trials focusing on patients with renal failure. In addition, we excluded trials with agents that are associated with harmful effects such as torcetrapib or hormones. We did further pre-specified sensitivity analyses excluding trials with one year or less of follow-up and excluding trials with two years or less of follow-up, as lipid effects may take more than a year to fully translate into clinical effects.35 36 In response to reviewers’ comments, we added a sensitivity analysis focusing on trials with interventions specifically chosen to raise high density lipoprotein cholesterol (fibrates and niacin combinations) and another focusing on trials that reported intention to treat results. Finally, we investigated the association of treatment induced change in triglycerides concentrations with clinical outcomes by using the same approach as for high density lipoprotein cholesterol. We used SAS version 9.1 for analyses. We set the threshold for statistical significance at P<0.05. 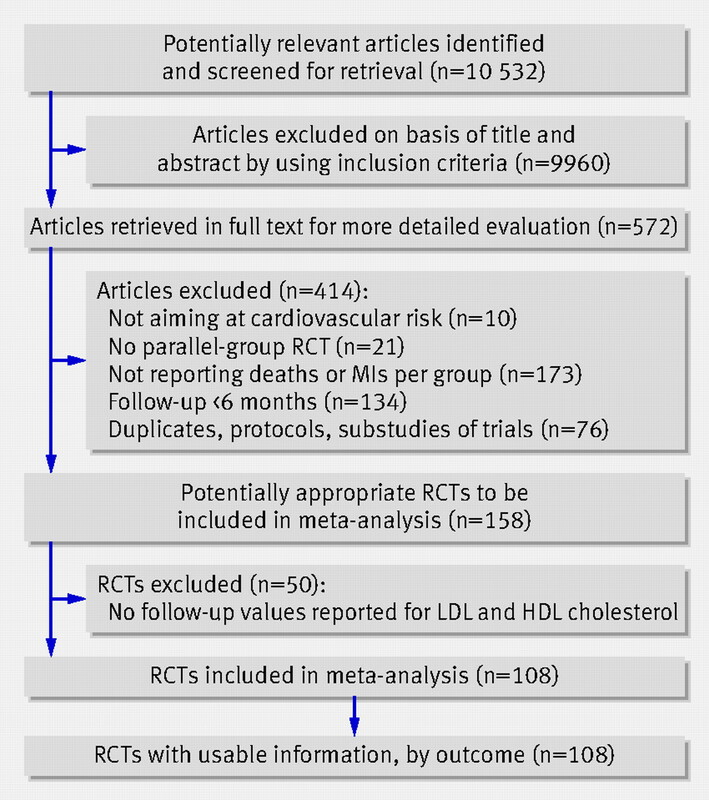 Of 158 eligible randomised controlled trials, 50 did not report change or follow-up values for both high density lipoprotein cholesterol and low density lipoprotein cholesterol and were therefore excluded, leaving 108 trials for analysis (figure⇓). Three of these 108 trials had multiple treatment arms, so we used the control group for comparison against all treatment arms. In total, 146 890 participants were included in the intervention groups and 152 420 in the control groups. The web appendix summarises the methodological quality assessment of included trials and characteristics of patient populations. On the basis of pharmacological characteristics, we classified trials according to the following classes of intervention37: statins (54 trials comparing statins with placebo or usual carew1-w54 and eight trials comparing more intensive with less intensive statin treatmentw55-w62); fibrates (nine trialsw63-w71); resins (three trialsw72-w74); niacin combinations with a statin, fibrate, or resin (six trialsA1;A75-A79); n-3 fatty acids (nine trialsw80-w88); acyl-CoA:cholesterol acyltransferase inhibitors (two trialsw92 w93); probucol (two trialsw21 w94); glitazones (two trialsw95 w96); hormones (nine trialsw97-w105); torcetrapib (two trialsw106 w107); low fat diets and surgery (five trialsw74 w89-w91 w108). Agreement between reviewers for study eligibility was very high (κ range 0.84-0.94). Table 1⇓ summarises the baseline concentrations and changes in lipid subfractions for the different classes of intervention. The average weighted mean baseline low density lipoprotein cholesterol concentration of all included participants was 140 (SD 23; range 84-279) mg/dl (3.62 mmol/l), and the high density lipoprotein cholesterol concentration was 47 (7.4; 32-62) mg/dl (1.22 mmol/l). The weighted mean change in low density lipoprotein cholesterol was −23 (SD 19) mg/dl (−0.59 mmol/l), and the weighted mean change in high density lipoprotein cholesterol was 1.7 (3.1) mg/dl (0.04 mmol/l). Almost all classes of intervention reduced low density lipoprotein cholesterol except for n-3 fatty acids and glitazones. High density lipoprotein cholesterol was raised by most classes of intervention except for n-3 fatty acids, low-fat diets, acyl-CoA:cholesterol acyltransferase inhibitors, and probucol. In addition, high dose statin treatment (defined as 80 mg daily simvastatin or atorvastatin) slightly reduced high density lipoprotein cholesterol compared with less intensive statin treatment (weighted mean change −0.23 (SD 0.83) mg/dl),w56-w59 w61 w62 whereas statins overall raised it moderately (weighted mean change 1.6 (1.5) mg/dl). Change in low density lipoprotein cholesterol was associated with and explained a statistically significant degree of variability in the log risk ratio for coronary heart disease events, coronary heart disease death, and total death in univariable and multivariable meta-regression analysis adjusted for change in high density lipoprotein cholesterol and different drug classes (table 2⇓). For example, the risk ratio for coronary heart disease events (death or non-fatal myocardial infarction) was reduced, on average, by 7.1% (95% confidence interval 4.5% to 9.8%; P <0.001) per 10 mg/dl (0.26 mmol/l) reduction in low density lipoprotein cholesterol in a multivariable model. Change in low density lipoprotein cholesterol explained 32% of the variability in the log risk ratio for coronary heart disease events (see R2 for univariable model with low density lipoprotein cholesterol in table 2⇓). We found no significant association of change in high density lipoprotein cholesterol with the log risk ratio in any model after adjustment for changes in low density lipoprotein cholesterol (see table 2⇑ and results of analyses stratified by drug class in web table A). For example, the risk ratio for coronary heart disease events was increased, on average, by 16% (−4.2% to 36.9%; P=0.12) per 10 mg/dl increase in high density lipoprotein cholesterol according to our multivariable model in table 2⇑. Change in high density lipoprotein cholesterol hardly explained any variability in any of the outcomes (see R2 results in table 2⇑ and web table A). The change in the quotient of low density lipoprotein cholesterol and high density lipoprotein cholesterol explained 32%, 12%, and 15% of the variability in log risk ratios for coronary heart disease events, total death, and coronary heart disease death, which is no more than the change in low density lipoprotein cholesterol alone explained for these outcomes (see R2 results for univariable models with low density lipoprotein cholesterol in table 2⇑). Sensitivity analyses focusing on a more homogeneous sample of trials (interventions known to raise high density lipoprotein cholesterol and excluding trials using agents associated with harmful effects) revealed a significant association of change in high density lipoprotein cholesterol and the log risk ratio for coronary heart disease events in univariable analysis, with a 29% (51.7% to 6.6%; P=0.01) risk reduction for each 10 mg/dl increase in high density lipoprotein cholesterol (table 3⇓). This association was, however, no longer detectable in models adjusted for changes in low density lipoprotein cholesterol (bivariable or multivariable), indicating that the apparent reduction in outcomes was due to the association of changes in high density lipoprotein cholesterol with changes in low density lipoprotein cholesterol. Change in low density lipoprotein cholesterol remained significantly associated with the log risk ratio for coronary heart disease events, explaining greater variability in trials that had longer follow-up (R2 of 0.41, 0.46, and 0.51 for trials with a follow-up of six months or more, more than one year, and more than two years). Two additional sensitivity analyses focusing on trials with interventions specifically chosen to raise high density lipoprotein cholesterol and on trials reporting intention to treat results did not show any significant association of change in high density lipoprotein cholesterol with risk of coronary heart disease events. Similarly, we found no association between change in triglycerides and risk of coronary heart disease events whenever the model included an adjustment for the change in low density lipoprotein cholesterol (data available from the authors). Change in low density lipoprotein cholesterol, however, remained a significant predictor in a multivariable model adjusting for change in high density lipoprotein cholesterol, change in triglycerides, and class of intervention, with a 7.4% (4.4% to 10.4%; P <0.001) relative risk reduction for coronary heart disease events. Model residuals were normally distributed with constant variance (homoscedasticity). Including quadratic or exponential terms did not improve the fit of models. We found no evidence of collinearity. Strengths of this study include a comprehensive scope that included a wide range of patients at risk of cardiovascular events and a wide variety of lipid modifying interventions, maximising the power of our analysis. Our extensive literature search supplemented by contacting experts in the field to retrieve all relevant eligible trials minimised the potential for publication bias, but we cannot exclude it completely. We could not include 50 otherwise eligible trials that failed to measure or did not report follow-up values or change in low density lipoprotein cholesterol or high density lipoprotein cholesterol (for details see web appendix). Unidentified trials or trials that failed to report data on high density lipoprotein cholesterol or low density lipoprotein cholesterol reduced the power of our analysis but were unlikely to bias its results. A meta-regression such as ours relies on variability across studies in both the differences between high density lipoprotein cholesterol in treatment and control groups and variability in magnitude of effect. Thus, the analysis is powerful to the extent that it includes studies in which differences in high density lipoprotein cholesterol are modest (such as with statins) or non-existent and studies in which differences are large (niacin). Our analysis would have been stronger if we had had access to data from additional studies in which differences in changes in high density lipoprotein cholesterol between treatment and control were large. Nevertheless, variability was sufficient that if a strong effect of high density lipoprotein cholesterol existed we would probably have detected it. Nevertheless, the relation described by a meta-regression is observational—that is, although the original studies may be randomised trials, a meta-regression across trials does not have the benefit of randomisation to support a causal interpretation and thus risks bias by confounding. Moreover, regression analysis typically ignores the effect of measurement errors in the independent variables. Although this may be problematic to the extent that older studies used less precise methods to determine lipid subfractions, our meta-regression involves mean values of the independent variables. The standard errors of these means are substantially smaller than the standard deviations of individual participants’ values, which should mitigate the problem. Our classification of lipid modifying interventions may be argued to combine antilipidaemic agents and diets that have important pharmacological differences or mechanisms of action37—for example, in trials classified under niacin treatment, niacin could be combined with a statin, a fibrate, or a resin. Different interventions that alter high density lipoprotein cholesterol may have different impacts on cardiovascular risk. Interventions may lead to different types of high density lipoprotein cholesterol with differences in function (see below); they may raise high density lipoprotein cholesterol by reduced catabolism (which may be detrimental) or increased production (more likely to be beneficial). Our adjustment of the analysis by type of intervention (drug class) deals with this problem to a considerable extent but may not fully solve it. Our findings contribute to accumulating evidence that simply increasing the amount of circulating high density lipoprotein cholesterol does not necessarily confer cardiovascular benefits.17 18 19 20 40 In the case of torcetrapib, one of the most potent high density lipoprotein raising agents to date, the failure to improve intracoronary atheroma burden in ultrasound studies and the excess mortality seen in the Investigation of Lipid Level Management to Understand its Impact in Atherosclerotic Events (ILLUMINATE) trial may be explained by a molecule specific increase in blood pressure (perhaps owing to increased concentrations of aldosterone) or unforeseen interactions between torcetrapib and atorvastatin.17 18 20 41 42 Recent data suggest the former possibility43; if so, other cholesteryl ester transfer protein inhibitors may still hold promise. Available measures of the function of high density lipoprotein cholesterol include indices of inflammation, oxidation, monocyte chemotaxis, nitric oxide production, endothelial function, and thrombosis, as well as tests assessing the reverse cholesterol transport effects of treatments.50 However, further development is necessary to satisfy the urgent need for a reliable and easily applicable assay of high density lipoprotein cholesterol function. We thank Christina Lacchetti, Jean Mackay, Kate Bak, and Sara Kaffashian, who helped with screening of titles and abstracts of potentially eligible publications. Contributors: MB, SDW, COR, EJM, HCB, VMM, and GHG conceived, designed, and planned the study. MB, XW, AS, NV, and NB were responsible for the electronic search, data collection, full text retrieval, and data entry. MB, IFG, JJY, PJK, EAA, PW, BB, DB, AS, IW, SAdS, ZK, AJN, and EJM checked eligibility, assessed trial quality, and extracted data. QZ and SDW provided statistical expertise. COR, EJM, and GHG obtained funding. All authors discussed the results. MB and GHG drafted the manuscript; all the other authors critically revised the manuscript for important intellectual content. MB and GHG are the guarantors. Funding: The study was supported by an unrestricted educational grant from Pfizer. MB is supported by a scholarship award of the Swiss National Foundation (PASMA—112951/1). JJY is supported by an Ontario Ministry of Health and Long-Term Care Career Scientist Award. The funding sources had no role in the study design; the collection, analysis, and interpretation of data; or the writing of the report. Competing interests: COR is a salaried employee of Pfizer UK. Gordon T, Castelli WP, Hjortland MC, Kannel WB, Dawber TR. High density lipoprotein as a protective factor against coronary heart disease: the Framingham study. Am J Med1977;62:707-14. Assmann G, Schulte H, von Eckardstein A, Huang Y. High-density lipoprotein cholesterol as a predictor of coronary heart disease risk: the PROCAM experience and pathophysiological implications for reverse cholesterol transport. Atherosclerosis1996;124(suppl):S11-20. DeGoma EM, Leeper NJ, Heidenreich PA. Clinical significance of high-density lipoprotein cholesterol in patients with low low-density lipoprotein cholesterol. J Am Coll Cardiol2008;51:49-55. Barter P, Gotto AM, LaRosa JC, Maroni J, Szarek M, Grundy SM, et al. HDL cholesterol, very low levels of LDL cholesterol, and cardiovascular events. N Engl J Med2007;357:1301-10. Frikke-Schmidt R, Nordestgaard BG, Stene MC, Sethi AA, Remaley AT, Schnohr P, et al. Association of loss-of-function mutations in the ABCA1 gene with high-density lipoprotein cholesterol levels and risk of ischemic heart disease. JAMA2008;299:2524-32. Zhong S, Sharp DS, Grove JS, Bruce C, Yano K, Curb D, Tall AR. Increased coronary heart disease in Japanese-American men with mutation in the cholesteryl ester transfer protein gene despite increased HDL levels. J Clin Invest1996;97:2917-23. Summary of the second report of the National Cholesterol Education Program (NCEP) Expert Panel on Detection, Evaluation, and Treatment of High Blood Cholesterol in Adults (Adult Treatment Panel II). JAMA1993;269:3015-23. Adult Treatment Panel III. Executive summary of the third report of the National Cholesterol Education Program (NCEP) Expert Panel on Detection, Evaluation, and Treatment of High Blood Cholesterol in Adults (Adult Treatment Panel III). JAMA2001;285:2486-97. Grundy SM, Cleeman JI, Merz CN, Brewer HB Jr, Clark LT, Hunninghake DB, et al. Implications of recent clinical trials for the National Cholesterol Education Program Adult Treatment Panel III guidelines. Arterioscler Thromb Vasc Biol2004;24:e149-61. Coronary Drug Project. Clofibrate and niacin in coronary heart disease. JAMA1975;231:360-81. Carlson LA, Rosenhamer G. Reduction of mortality in the Stockholm ischaemic heart disease secondary prevention study by combined treatment with clofibrate and nicotinic acid. Acta Med Scand1988;223:405-18. Brown BG, Zhao XQ, Chait A, Fisher LD, Cheung MC, Morse JS, et al. Simvastatin and niacin, antioxidant vitamins, or the combination for the prevention of coronary disease. N Engl J Med2001;345:1583-92. Brown G, Albers JJ, Fisher LD, Schaefer SM, Lin JT, Kaplan C, et al. Regression of coronary artery disease as a result of intensive lipid-lowering therapy in men with high levels of apolipoprotein B. N Engl J Med1990;323:1289-98. Whitney EJ, Krasuski RA, Personius BE, Michalek JE, Maranian AM, Kolasa MW, et al. A randomized trial of a strategy for increasing high-density lipoprotein cholesterol levels: effects on progression of coronary heart disease and clinical events. Ann Intern Med2005;142:95-104. Robins SJ, Collins D, Wittes JT, Papademetriou V, Deedwania PC, Schaefer EJ, et al. Relation of gemfibrozil treatment and lipid levels with major coronary events: VA-HIT—a randomized controlled trial. JAMA2001;285:1585-91. Manninen V, Elo MO, Frick MH, Haapa K, Heinonen OP, Heinsalmi P, et al. Lipid alterations and decline in the incidence of coronary heart disease in the Helsinki heart study. JAMA1988;260:641-51. Tall AR, Yvan-Charvet L, Wang N. The failure of torcetrapib: was it the molecule or the mechanism? Arterioscler Thromb Vasc Biol2007;27:257-60. Nissen SE, Tardif JC, Nicholls SJ, Revkin JH, Shear CL, Duggan WT, et al. Effect of torcetrapib on the progression of coronary atherosclerosis. N Engl J Med2007;356:1304-16. Tardif JC, Gregoire J, L’Allier PL, Ibrahim R, Lesperance J, Heinonen TM, et al. Effects of reconstituted high-density lipoprotein infusions on coronary atherosclerosis: a randomized controlled trial. JAMA2007;297:1675-82. Kastelein JJ, van Leuven SI, Burgess L, Evans GW, Kuivenhoven JA, Barter PJ, et al. Effect of torcetrapib on carotid atherosclerosis in familial hypercholesterolemia. N Engl J Med2007;356:1620-30. Dean BB, Borenstein JE, Henning JM, Knight K, Merz CN. Can change in high-density lipoprotein cholesterol levels reduce cardiovascular risk? Am Heart J2004;147:966-76. White C. Suspected research fraud: difficulties of getting at the truth. BMJ2005;331:281-8. Berthold HK, Unverdorben S, Degenhardt R, Bulitta M, Gouni-Berthold I. Effect of policosanol on lipid levels among patients with hypercholesterolemia or combined hyperlipidemia: a randomized controlled trial. JAMA2006;295:2262-9. Studer M, Briel M, Leimenstoll B, Glass TR, Bucher HC. Effect of different antilipidemic agents and diets on mortality: a systematic review. Arch Intern Med2005;165:725-30. Hooper L, Thompson RL, Harrison RA, Summerbell CD, Moore H, Worthington HV, et al. Omega 3 fatty acids for prevention and treatment of cardiovascular disease. Cochrane Database Syst Rev2004;(4):CD003177. Hooper L, Summerbell CD, Higgins JP, Thompson RL, Clements G, Capps N, et al. Reduced or modified dietary fat for preventing cardiovascular disease. Cochrane Database Syst Rev2001;(3):CD002137. Richter B, Bandeira-Echtler E, Bergerhoff K, Clar C, Ebrahim SH. Pioglitazone for type 2 diabetes mellitus. Cochrane Database Syst Rev2006;(4):CD006060. Gabriel SR, Carmona L, Roque M, Sanchez GL, Bonfill X. Hormone replacement therapy for preventing cardiovascular disease in post-menopausal women. Cochrane Database Syst Rev2005;(2):CD002229. Juni P, Witschi A, Bloch R, Egger M. The hazards of scoring the quality of clinical trials for meta-analysis. JAMA1999;282:1054-60. Hozo SP, Djulbegovic B, Hozo I. Estimating the mean and variance from the median, range, and the size of a sample. BMC Med Res Methodol2005;5:13. Deeks JJ, Higgins JPT, Altman DG, eds. Data extraction for continuous outcomes. In: Higgins JPT, Green S, eds. Cochrane Handbook for Systematic Reviews of Interventions 4.2.6 [updated September 2006]; Section 8. www.cochrane.org/resources/handbook/Handbook4.2.6Sep2006.pdf. Scandinavian Simvastatin Survival Study Group. Randomised trial of cholesterol lowering in 4444 patients with coronary heart disease: the Scandinavian simvastatin survival study (4S). Lancet1994;344:1383-9. The Long-term Intervention with Pravastatin in Ischaemic Disease (LIPID) Study Group. Prevention of cardiovascular events and death with pravastatin in patients with coronary heart disease and a broad range of initial cholesterol levels. N Engl J Med1998;339:1349-57. McAlister FA, Laupacis A, Wells GA, Sackett DL. Users’ guides to the medical literature: XIX. Applying clinical trial results B: guidelines for determining whether a drug is exerting (more than) a class effect. JAMA1999;282:1371-7. Babyak MA. What you see may not be what you get: a brief, nontechnical introduction to overfitting in regression-type models. Psychosom Med2004;66:411-21. Baigent C, Keech A, Kearney PM, Blackwell L, Buck G, Pollicino C, et al. Efficacy and safety of cholesterol-lowering treatment: prospective meta-analysis of data from 90,056 participants in 14 randomised trials of statins. Lancet2005;366:1267-78. Singh IM, Shishehbor MH, Ansell BJ. High-density lipoprotein as a therapeutic target: a systematic review. JAMA2007;298:786-98. Bots ML, Visseren FL, Evans GW, Riley WA, Revkin JH, Tegeler CH, et al. Torcetrapib and carotid intima-media thickness in mixed dyslipidaemia (RADIANCE 2 study): a randomised, double-blind trial. Lancet2007;370:153-60. Barter PJ, Caulfield M, Eriksson M, Grundy SM, Kastelein JJ, Komajda M, et al. Effects of torcetrapib in patients at high risk for coronary events. N Engl J Med2007;357:2109-22. Nicholls SJ, Brennan DM, Wolski K, Kalidindi SR, Moon K, Tuzcu EM, et al. Changes in levels of high density lipoprotein cholesterol predict the impact of torcetrapib on progression of coronary atherosclerosis: insights from ILLUSTRATE. Circulation2007;116:II-127 (abstract 684). Navab M, Anantharamaiah GM, Reddy ST, Van Lenten BJ, Ansell BJ, Fogelmann AM. Mechanisms of disease: proatherogenic HDL—an evolving field. Nat Clin Pract Endocrinol Metab2006;2:504-11. Zheng L, Nukuna B, Brennan ML, Sun M, Goormastic M, Settle M, et al. Apolipoprotein A-I is a selective target for myeloperoxidase-catalyzed oxidation and functional impairment in subjects with cardiovascular disease. J Clin Invest2004;114:529-41. Ansell BJ, Watson KE, Fogelman AM, Navab M, Fonarow GC. High-density lipoprotein function recent advances. J Am Coll Cardiol2005;46:1792-8. Ansell BJ, Fonarow GC, Fogelman AM. High-density lipoprotein: is it always atheroprotective? Curr Atheroscler Rep2006;8:405-11. Meyers CD, Kashyap ML. Pharmacologic elevation of high-density lipoproteins: recent insights on mechanism of action and atherosclerosis protection. Curr Opin Cardiol2004;19:366-73. Roberts CK, Ng C, Hama S, Eliseo AJ, Barnard RJ. Effect of a short-term diet and exercise intervention on inflammatory/anti-inflammatory properties of HDL in overweight/obese men with cardiovascular risk factors. J Appl Physiol2006;101:1727-32. DeGoma EM, deGoma RL, Rader DJ. Beyond high-density lipoprotein cholesterol levels evaluating high-density lipoprotein function as influenced by novel therapeutic approaches. J Am Coll Cardiol2008;51:2199-211. Grundy SM, Cleeman JI, Daniels SR, Donato KA, Eckel RH, Franklin BA, et al. Diagnosis and management of the metabolic syndrome: an American Heart Association/National Heart, Lung, and Blood Institute scientific statement. Circulation2005;112:2735-52. Haffner SM. Dyslipidemia management in adults with diabetes. Diabetes Care2004;27(suppl 1):S68-71.